There is a museum of hina dolls at the Achi Shrine. 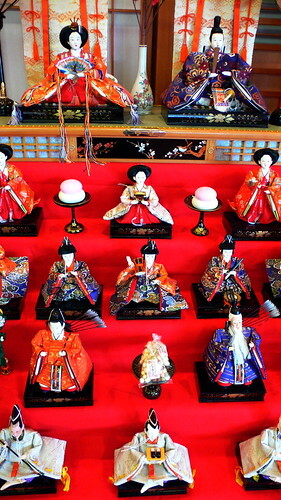 Several different types of hina dolls are on display, and there are numerous ‘full courts’ presented in the large second-story room that houses the bulk of the collection. There’s even a small statue of Izanami and Izanagi, the mythical creators of the Japanese islands and the parents of Amaterasu, the sun goddess to whom the Japanese imperial family traces their ancestry. It’s no accident that Izanami and Izanagi should show up here because their coupling is considered foundational for Japanese history and culture and the tenno and tennyo (emperor and empress) who always sit at the top of a full hina display are viewed as their direct descendants (at least, until the end of WWII). 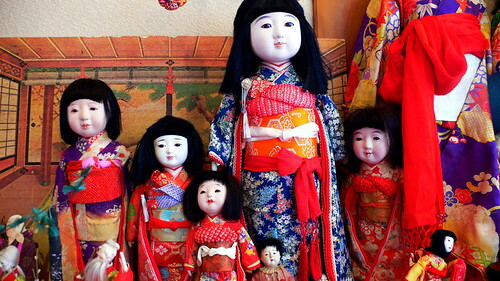 Though the Hina Matsuri, or “Girl’s Day,” as it’s sometimes translated, is now primarily associated with the idea of good fortune in life and family, the origins of the Hina Matsuri are deeply steeped in ancient purification rituals. The origins of the Hina-matsuri are inextricably linked with the court festivities surrounding joshi, the first day of the snake and a traditional day of purification. The origins of joshi lie in an early Chinese purification rite whereby people submerged themselves in streams, washing away impurities. 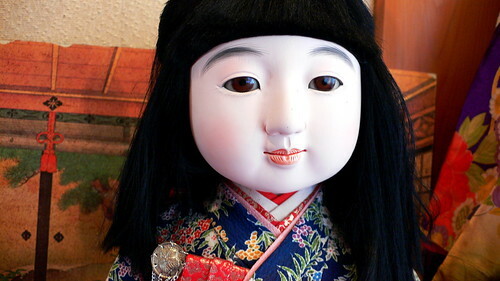 As part of the joshi celebrations, paper dolls called nademono were also fashioned and then rubbed over the body to absorb evil influences before being destroyed. Although the stages in their development are unclear, nademono evolved from simple paper doll forms designed to be purged to the more elaborate standing hina figures called tachi-bana. The development of tachi-bana is seen to mark the beginnings of Hina-matsuri in the form we know it today.